ARGON servo drive available with introductory discount one more week! 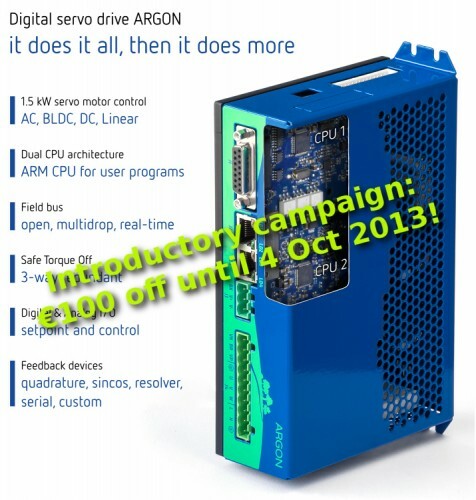 The €100 introductory discount per Argon drive is valid until 4.10.2013. No minimum or maximum order quantity limits apply! Argon production is finally fully operational, so no longer long waits! After placing the order (until Oct 4), there is 21 days time to complete payment to keep the order and discount active. For ordering, see Argon web shop. Update: whooops, I had wrong month name here (Aug). Now fixed to Oct! We have encountered a flaw in the Argon firmware that puts drive power stage transistors in danger if safe torque off (STO) was activated in certain conditions. This issue has been fixed in a firmware version 1.0.3 available here. Please upgrade FW before continuing use of the drives! The bug endangered only the drive itself. Regardless of this issue, STO function has always worked without compromising user or machine safety. STO is based on hardware circuits thus software can’t defeat it even if it wanted so. Safe torque off testing once STO2 activated. When STO2 is activated, the gate drive voltage will be removed from the power stage forcing motor driving transistors in non-conductive state. 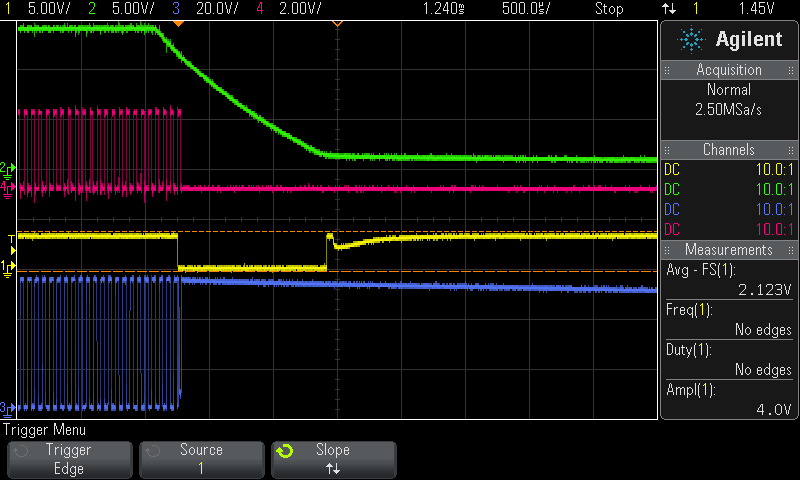 Traces: green=gate supply voltage, red=PWM signal from DSP to power stage, yellow=under voltage fault from power stage, blue=output voltage of power stage (measured at motor terminal). From the traces we see that STO2 reacted within 300 µs from activation. The technical background in this issue was that the power stage module’s built-in under voltage lock-out protects only half of the transistors inside. The other half of transistors are able to run despite gate voltage being too low which could cause high heat dissipation and transistor melt down. 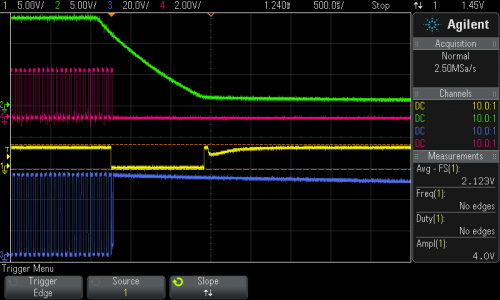 This has been fixed by shutting down the controlling PWM signal once power stage’s undervoltage fault becomes active. In the other news, we finally received more Argon in stock! All pending orders will ship on Monday. Update 26.9.2013: The users who had drives damaged due to this bug have been successfully served by repairing or replacing the drives for free. Such faults are always covered by warranty. 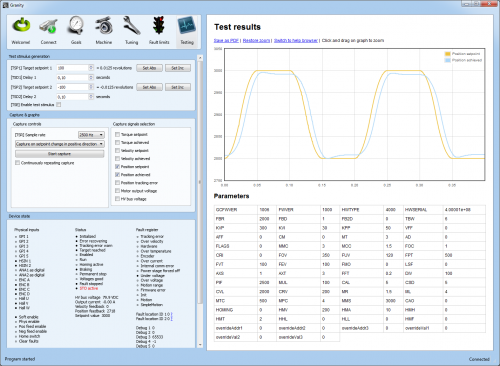 Argon firmware 1.0.2 has been released containing many significant changes. It can be downloaded from here. 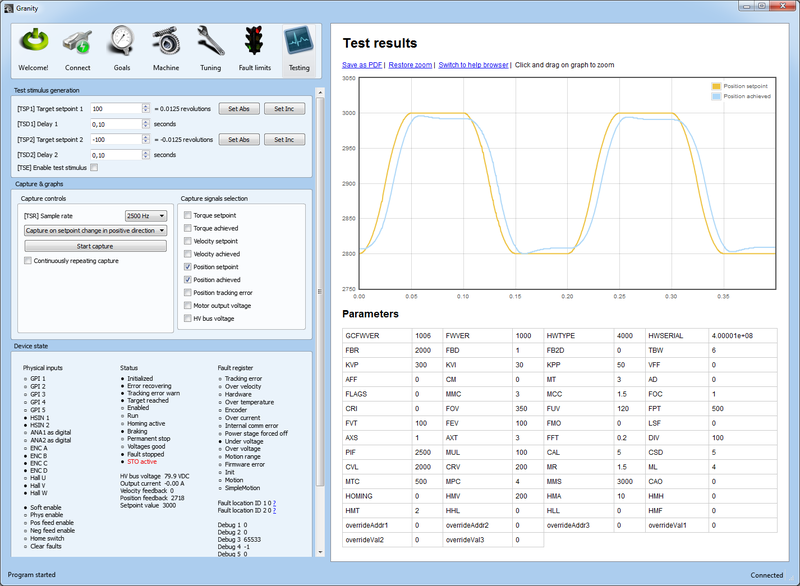 At the same time also Granity 1.0.2 has been released to add support for the new features. One of the most notable change is re-calibration of dead-time distortion correction yielding significantly better servo performance. The earlier firmware was actually calibrated for one of the prototype drives while the latest release has been optimized for the final drive version featuring faster IGBT transistors in the power stage. Dead-time distortion correction in action. 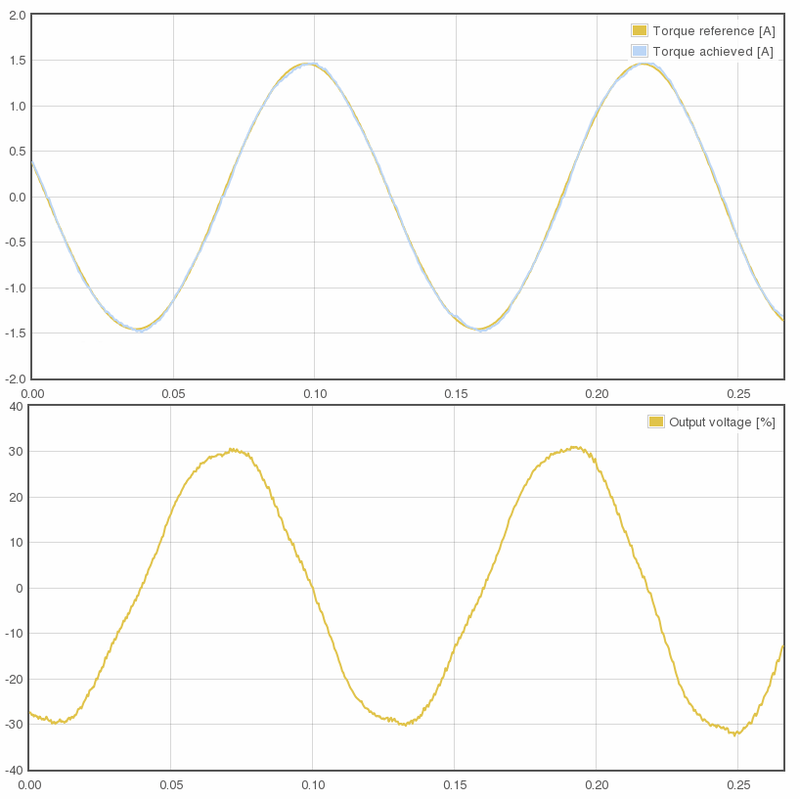 The result is near pure sinusoidal current waveforms. I’m currently working on a Argon firmware update that has significance to most of users. It should be ready until Friday. Stay tuned! Today I visited the factory manufacturing Argon drives and delivered the testing system as designed earlier and instructed them the usage of it. Regardless of Asian EMS services eating European manufacturers’ jobs, this company seems to be doing very well. 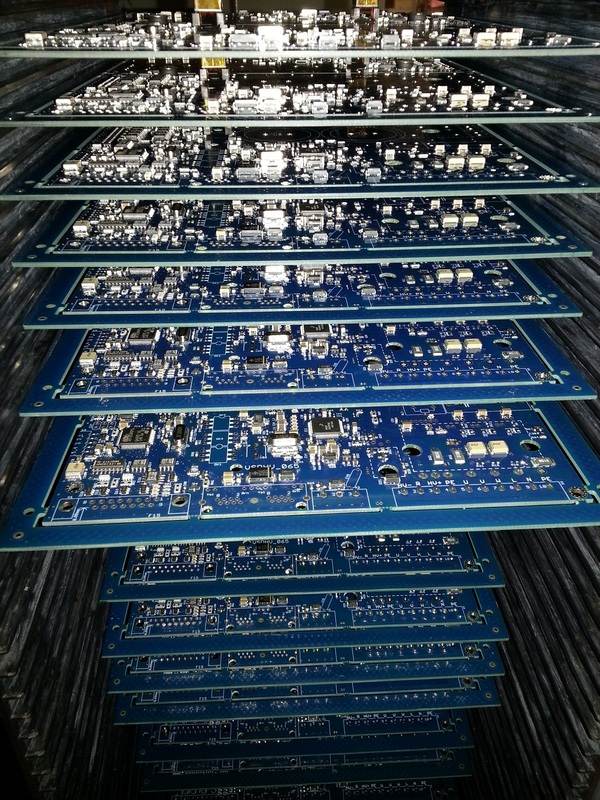 There were brand new SMT pick’n’place machines and nitrogen atmosphere wave soldering equipment waiting for commissioning to increase the number of manufacturing lines. I was told that the nitrogen atmosphere soldering gives better solder quality than normal air atmosphere systems. 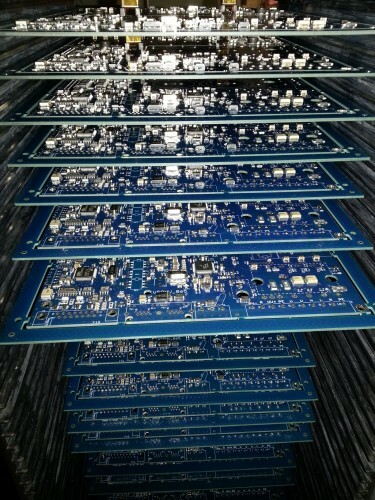 It seems that production is little bit behind from the last estimate, but these boards should be ready during this week if they accept the testing system as is. There was some talk about how to change it for their habits better, but I hope its quick change if needed. Keep the feedback & ideas coming! Fixing the found issues and making important improvements is the first priority for us.